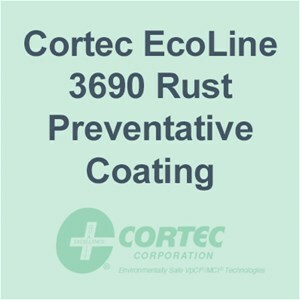 Ecoline 3690 is a biodegradable, biobased, ready-to-use temporary coating designed for severe marine and high humidity conditions. When applied on the surface, this product leaves an oily film, which provides excellent outdoor protection on any metal surface. The film is self-healing and moisture displacing, providing superior protection against aggressive environments. Based on canola oil, EcoLine 3690 is 76% biobased, and has been awarded the USDA BioPreferred designation. Available in 5 Gallon Plastic Pail (Cortec Item #12603655) or 55 Gallon Metal Drum (Cortec Item #12603656). Product Preparation: Product should be mixed thoroughly and uniform prior to use. Product Application: Product can be applied by spray, brush, roll or dip. Normal DFT is 2 mils (50 microns). Apply EcoLine 3690 in a well-ventilated area. Product Cleanup: For cleanup of tools and overspray, use alkaline cleaners such as mineral spirits.